MyMemories Blog: Meet Today's Daily Designer....Magical Reality Designs! Meet Today's Daily Designer....Magical Reality Designs! 2006. My main "signature" style is mostly fantasy/fairy type things and very magical, with LOTS of sparkles!!! but I do offer other styles too, so you can always find something you like. photography and digital graphics just took over my life..ha ha . I was born in Poland (Warsaw) and came to Canada (Ontario) at the age of 9 so English is my second language. Something that most people don't know about me is that I am a MAJOR xbox online gamer!..lol. I am addicted to playing Call of Duty MW3, and Battlefiled 4. I would also like to take this opportunity to THANK YOU for all your support in my designing, your wonderful emails, comments and pages you've made using my designs, so during my Feature I invite you to SAVE 40% on my whole shop from August 26- August 31. 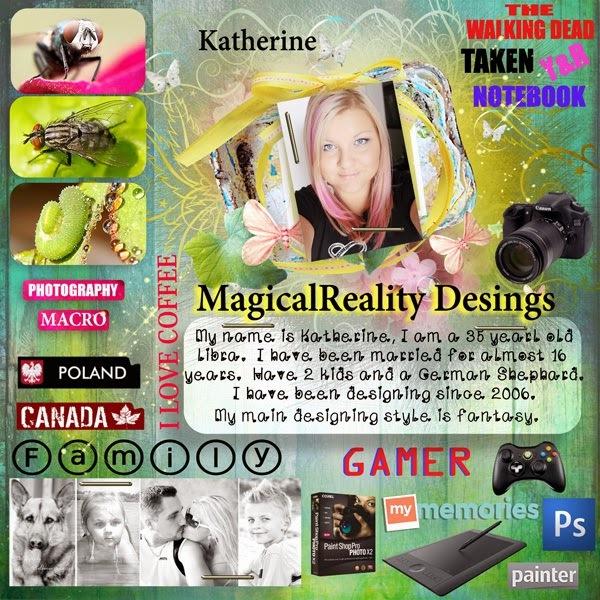 Also visit Magical Reality Designs on these other Social sites! Enjoy 40% off Magical Reality Design Shop until August 31!